Get set for the unlimited fun and excitement in God’s Own Country with your family members as you arrive in Cochin. As you arrive, our friendly tour guides will receive you at the airport and drive you to Munnar. A picturesque hill station in Kerala, your arrival in Munnar will be greeted with your checking-in into a hotel or a resort, where you can spend the day at leisure following your overnight stay. Your family’s first morning in Kerala will get adorned with the enchanting beauty of Munnar’s magnificent hills and mountains. 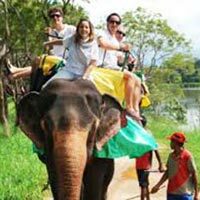 Completing breakfast, embark on a full-day sightseeing tour with your family and witness the captivating beauty of the hill station..
Visit tourist spots and places like Echo Point, Gundala Lake, Photo Point, Elephant Arrival Spot, Cinema Shooting Point, Mattuppetty, and Jungle Honey Bee Nest on the first half of the day. The second half of the day, you can visit Eravikulam National Park,Anaimudi Peak, Tata Tea Museum, Blossom Hydel Park, Headworks Dam, Spice Plantation, and Pothamedu. 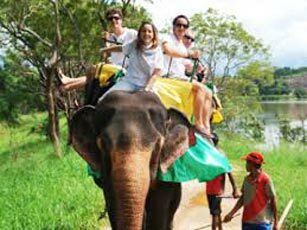 Come evening, you will be dropped at your hotel/resort for your overnight stay. .
After an amazing sightseeing tour, today, you will be driven to Thekkady or the abode of the Periyar National Park. A drive of around 3 hours will take you to this gorgeous wildlife abode, where you will be checked-in into a hotel followed by a boat ride along the Periyar Lake. This ride will get you introduced with the enchanting beauty of Thekkady’s pristine nature and wilderness! By evening, you will be dropped at the hotel for your overnight stay. Today, you can take a full-day sightseeing tour around Thekkady and discover its alluring charm and appeal. Following your family’s early morning breakfast, you will be taken for a boat cruise in the Periyar Lake, where you can spot an array of wildlife species like elephants, wild boars, deer, a number of exotic birds and several others. Returning from this boat excursion, you can opt for visits to some of the tribal villages around Thekkady and explore their local life and culture. By evening, the entire family will be driven back to the hotel; overnight stay will be at the hotel. This morning, after having breakfast with your family, it will be time for you to visit Alleppey or the ‘Backwater Capital’ of Kerala. Completing the short drive to this gorgeous backwater destination, your arrival in Alleppey will be followed by your checking-in into an exotic houseboat. Settle down, relax and get freshened up within the boat, and embrace the charm of the day with a backwater cruise. Cruise the narrow canals, enjoy the opulent beauty of the coconut lagoons and visit some of the coir villages in Alleppey. By evening, as the houseboat anchors down, you can feast on the tranquillity of the evening and spend overnight in the houseboat. Today, your Kerala family holiday will take the entire family to Kovalam! One of the most gorgeous beach destinations in God’s Own Country, this is the place where you can play with the warm sands and enjoy the alluring waves of the mighty Arabian Sea! Arriving in Kovalam, visit the Kovalam Beach and enjoy activities like sunbathing, swimming, herbal body massages and several others. Cultural programmes and catamaran cruise will follow your day, and with the advent of the evening, you will be checked-in into a beach resort for your overnight stay. Following yourtoday’s breakfast, your Kerala family holiday package will come to an end. Today, you will be dropped at Trivandrum Airport, and with your drop, the tour will come to an end. Arriving in Kanyakumari, you can take a boat ride to the Vivekananda Rock Memorial, where Swami Vivekananda used to meditate in the past. On completion of this ride, you will be driven back to the Kovalam beach resort for your overnight stay.